Nicoise salad, that lovely Mediterranean dish, is usually made with tuna. This version features grilled chicken, a delicious alternative to the fish. 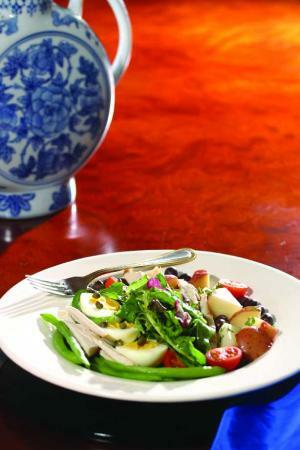 All the other good things that make a Nicoise salad a classic - the potatoes, olives, beans, and a grainy mustard vinaigrette- remain, creating a colorful and multi-textured dish. Here's a chance to use those "rainy day" grilled or broiled chicken cutlets you've cleverly prepared and stored. Or, using a grill pan for speed and convenience, prepare the cutlets especially for the salad -it's worth it! In a small bowl, combine vinaigrette ingredients. Season to taste with the salt and pepper and whisk to blend. Toss potatoes with 2 tablespoons of the vinaigrette while still warm. Reserve. Toss green beans with 2 tablespoons of the vinaigrette and reserve. Arrange the mesclun in the center of a plate and drizzle with vinaigrette; arrange the tomatoes, olives, eggs, and chicken strips around the greens and drizzle with remaining dressing. Sprinkle with capers and parsley.